Franklin & Company Tavern: New Happy Hour Menu and extended hours. Now 3pm-6pm!!! 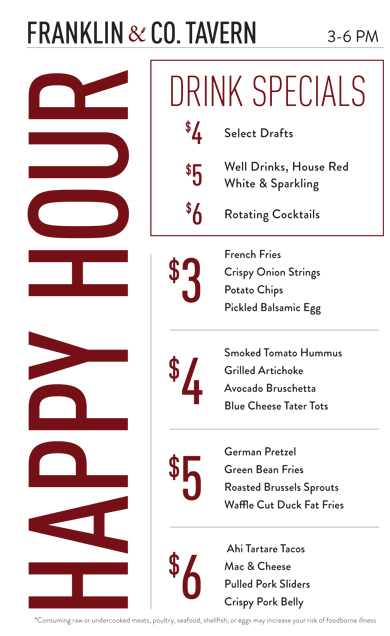 New Happy Hour Menu and extended hours. Now 3pm-6pm!!! The perfect event starts with an extraordinary location. Whether you are dreaming of a grand entrance on a mountaintop vineyard estate, or an intimate gathering of family and friends at a seaside villa, good managers, like those at San Francisco event venues are able to turn that dream into an extraordinary wedding.